Japan may be one of many tourist top destination country, but not everyone can visit Japan because of the high cost and incapable of speaking Japanese. A usual tour service usually charge about 2000-3000 USD for travelling inside Japan cities, but not everyone can pay the high cost only for a 7 days tour. One of alternative way to visit Japan is by ferry from Shanghai. Shanghai, the modern city in China, is the world's third largest port and China's largest seaport. We can use the ferry from Shanghai, cross the East China Sea to Osaka. 'New Jianzhen' is a passenger and cargo ship sailing regularly between Shanghai and Japan. It starts from Shanghai at 13:00 every Saturday, and arrives at Kobe or Osaka Ports of Japan on Monday morning the next week. The ship makes its return voyage from Kobe or Osaka at 12:00 every Tuesday, and it reaches Shanghai on Thursday. The speed of the ship is low, and a round trip usually takes over 80 hours. However there are still many people who choose this liner because of the good environment, excellent service, and low price. A single journey ship passage costs CNY1,300 to CNY2,600 (JPY20,000 to JPY40,000) per person according to the standard of cabin chosen. Alternatively you can pay CNY6,500 (JPY100,000) for a VIP room, which can accommodate two persons. For more information of this liner, you can phone 021-63257642. 'Suzhou' ship also voyages between Shanghai and Osaka in Japan. Starting from Shanghai at 11:00 every Tuesday, it reaches Osaka at 9:00 on Thursday. Every Friday, the ship makes its return at 12:00, and gets to Shanghai on Sunday. The ship passage is almost the same as that of 'New Jianzhen' ship. When you take an international cruise, you'd better go to the port two hours before departure to conduct the boarding procedures. Ship tickets can be bought or booked at Shanghai International Ferry Co., Ltd. with your passport or other valid identification. After completion of the whole project, Shanghai Port International Cruise Terminal will have more international passenger liners to facilitate the needs of modern tourism. 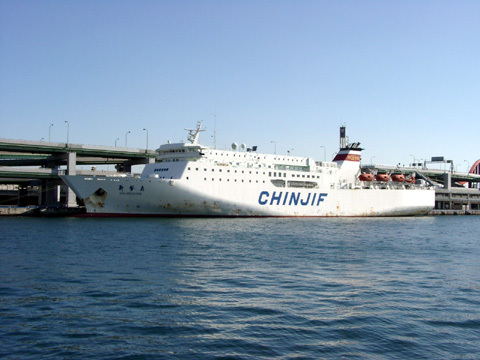 The Shanghai Ferry Company operates a weekly service between Osaka and the Chinese port city of Shanghai. The journey takes approximately 48 hours. During these 48 hours they offer cheap and best service to their passengers at a very low rate. This ferry is Japan's first largest and modern ferry. One- way tickets cost between ¥20,000 and ¥50,000. They offer discounts of up to 40% on return fares and 10% discount is given to students is also available. Ferry runs weekly between Shanghai and Osaka, Japan. The ferry is having restaurants, a game room, and even karaoke on board, that makes your journey more enjoyable. It leaves from Waihongqiao Harbor every Tuesday at 11 AM and arrives in Osaka at 9 AM the following Thursday. They recently launched a ship from Shanghai's Waihongqiao Harbor every Saturday, alternating between Osaka and Kobe in Japan. The journey takes approximately two days and tickets for this journey can be booked through the company or through CITS. Tickets for this ferry can be booked through the company or through China International Travel Service (CITS), the government tourism office.